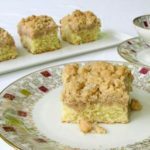 A recipe for old-fashioned buttery crumb cake also called crumb coffee cake. In a medium bowl, whisk together the flour, sugar, salt, and cinnamon. Add the vanilla to the melted butter. Pour the butter into the flour mixture and stir to mix until all the butter is absorbed and is a uniformly moistened crumb mixture. Set aside. Preheat oven to 350 degrees F. Grease a 9 X 13-inch baking pan. Line the pan with parchment paper and grease the paper. Set pan aside. In a large bowl, using an electric mixer cream the butter and sugar until light and fluffy. Add the eggs one at a time, mixing well after each addition. Scrape down the bowl. Add the sour cream and vanilla and mix to combine. In a medium bowl, whisk the flour, baking soda, salt, and baking powder together. Add the flour to the butter mixture and mix until combined. (Do not over-mix). Pour the batter into the prepared pan and spread batter evenly in the pan. Sprinkle the crumb mixture evenly over the batter. Bake for 30 to 35 minutes or until a cake tester inserted in the center comes out clean. Remove the cake from the oven and cool on a rack. Slice cooled cake into squares or rectangles. Serve and enjoy!